Barcelona trolled Manchester United after their comfortable 3-0 win at the Nou Camp, which knocked out the Red Devils out of the Champions League. 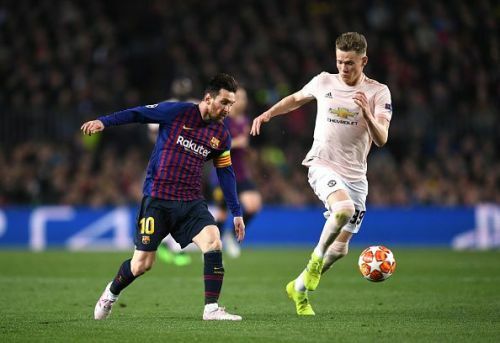 After enduring a 1-0 defeat in the first leg of the Champions League quarter-finals at Old Trafford, the Red Devils were given little chance of a comeback due to Barcelona's staggering record at their home ground. Eventually, the Catalan giants proved too much for the Red Devils, whose hopes of securing another comeback died when Lionel Messi scored twice in the span of five minutes in the first half. Two costly mistakes from Ashley Young and David De Gea led to the two goals, and United were all but out just after 20 minutes. Messi was obviously happy with his brace. "I was lucky [on the first goal]," he admitted. "The second I had even more luck. But the important thing is that we achieved our goal of reaching the quarter-finals, which we hadn't for a long time." "It was spectacular. This is who we are. We were cold and nervous for the first five minutes. I don't know why, but then we took control." The Blaugrana captain now remains the top scorer of the Champions League this season with 10 goals and leads the race for European Golden Shoe with 33 league goals. The Argentine also ended in goal drought in the Quarter Finals after numerous seasons. Messi is head and shoulders above the rest in the current campaign and depicted it once again against Manchester United. Minutes after their victory last night, the official Barcelona twitter account uploaded a picture of Lionel Messi along with the caption 'Messi at the wheel'. The post was a cheeky attempt of mocking Manchester United's chant 'Ole's at the wheel', after the United boss rejuvenation since taking charge of Red Devils last December. Manchester United will face Everton, Manchester City and Chelsea next in the Premier League. The Red Devils still have a lot to play this season as they fight to secure a top-four finish in the Premier League.